Did we mention we’ll be venturing to the famous windward coastline? This newly formed topography Oahu has been selected for many T.V. shows and Blockbuster movies. We have chosen the landscape because of its raw Hawaiian feel and atmosphere. After traveling around to bays made by volcanoes, blowholes, botanical gardens, battle locations, and local food stops, we will end this night photo journey with a powerful firework show and a little lesson in light painting. We could explain what it is exactly, but it’s better to witness this in person. Join us any Friday! Looking for something different to do in Hawaii? Oahu Photography Tours offer the “Sunset & Fireworks" Photography Tour” every Friday. This event is fantastic! We start by photographing Hanauma bay as the sun lights up its turquoise waters and abundant reefs. If you don't have the chance to swim in the bay, you'll have the opportunity to view it from above to capture panoramic photos of this world famous bay formed by a volcanic explosion. A short hop down the road is the Halona Blow-Hole lookout and the Kaiwi coastline. This area of O'ahu is much younger than the rest, and its rugged feel shows it. The blowhole is a perfect place to capture postcard quality photos. Eternity beach is located just below the lookout. A famous movie spot for many blockbuster films. Let's take time to stop and smell the Plumerias in a botanical garden hidden in a volcanic crater. Depending on the time of year, you can be overwhelmed by the pleasant scents of these tropical flowers. After a stop overlooking Makapu'u bay, we will fill our bellies with some delicious Hawaiian food at Ono's Steak and Shrimp. Our guides do not like stopping at mediocre food spots. Ono Steak and Shrimp have built a reputation for having some of the tastiest, juiciest, mouthwatering food around. We don't mess around when it comes to food. Let's walk off that meal on the white sands of Waimanalo Bay. The ironwood trees that line the shore create a dreamy look as if you are walking through a fairytale forest to a hidden beach you would only see in your dreams. Let's now find a place to set up for sunset. We have many different locations to choose from for your sunset photos. We don't want to label where we are going because we pay attention to a lot of variables for the sun as it sets. No matter what, we will find a place to watch the sun paint beautiful colors into the sky as it says its goodbye for the day. 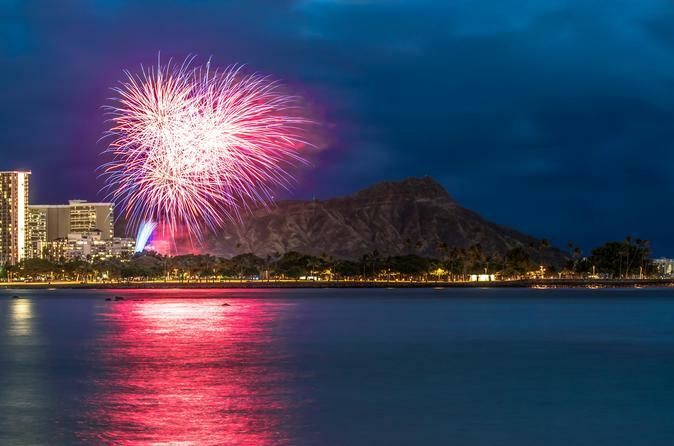 Did you know about the Friday night fireworks show in Waikiki? A joyful event that also happens to make for artistic photos! We’ll get you set up in a prime position to watch this sky performance as well as capture epic pictures. Don’t worry, shooting in low light may be intimidating but we’ll teach you how to use your camera to play with light and darkness and to take stellar photos during darker times of the day. It’s easier than you might think! You’ll be able to carry these techniques and skills with you into the future, and the photographs you’ll capture from this photo tour will astonish you!